It is no secret that a solid foundation is necessary for a sturdy structure. Your body is no different. If you are suffering from lower back pain, hip pain, knee pain, sciatica or something else, your feet are likely contributing to the problem. At Turning Point Chiropractic, we prescribe and fit Foot Levelers custom orthotics. Foot Levelers has been providing custom orthotics and research in the field of biomechanics for over 60 years. Custom orthotics are individually designed for your feet – helping achieve a balanced foundation and stabilized pelvis. Custom orthotics are handmade for your unique feet based on 3D scans we perform in our Saratoga Springs chiropractic office. 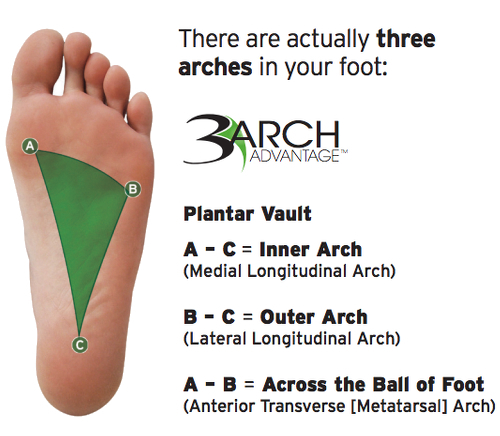 Only Foot Levelers customized orthotics support all 3 arches of the foot, which make up the plantar vault. Since Foot Levelers orthotics are custom-made by hand from scans of your feet, no two pairs of Foot Levelers custom orthotics are alike! The combination of 3-Arch Support, high quality technology and materials, and the uniqueness of each orthotic shaped and created to your feet results in an orthotic beyond what other companies can provide. The body assessment image shows how imbalances in the feet can lead to knee rotation, pelvic tilt and shoulder drop. These imbalances in the body can be caused by changes in the structure of the foot. These instabilities can lead to conditions such as plantar fasciitis, knee pain, hip pain, back pain, and neck pain. A properly aligned body will have symmetrical feet, level knees, pelvis and shoulders. Wearing custom orthotics combined with chiropractic care may help alleviate imbalances and conditions caused by those imbalances. In our Saratoga Springs chiropractic office we use the most advanced technology possible. Our foot scanner is equipped with a 3D laser mapping and high definition photo scanner. This creates a 3D image of your foot and analyzes various pressure points, compares arch heights and assesses how much weight you are putting on one foot over the other.